The firm discipline of documentation, the powerful choreography of title blocks and title boundaries, site plans and floor plans, details and dimensions. You are a guru of Rule #4, an elite soldier in the magical arts of documentation, and you understand that the choreography is all that matters. It tells what to draw and where, how to draw it and how much, when to start and when to stop. The choreography is your rule book, a categorised, itemised and pasteurised list of rules to live and die by. 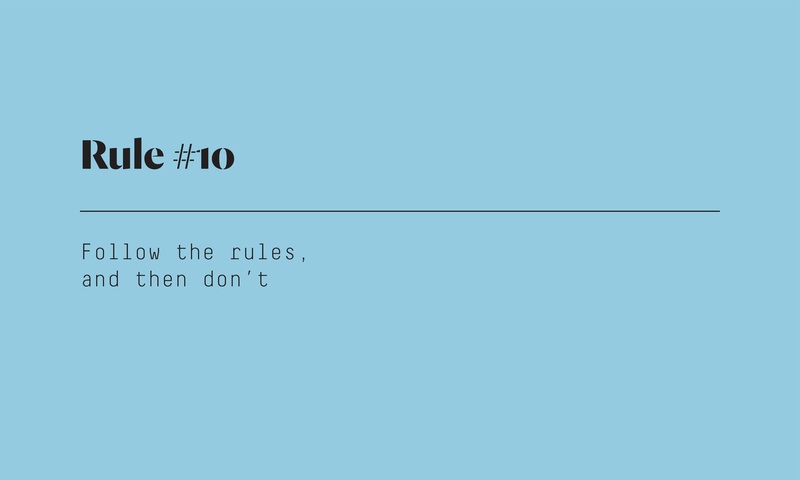 The rules are your friends. They help you fill an empty page, tame the wild explosion of drawing types and scales, maintain order. The make sure that when all is said and done, your drawings and the densely packed information they seek to communicate are legible. Lay out each page from top left to bottom right, like a book. Fill each page but don’t overfill it. Place title blocks along the bottom or righthand edge of the page. Point the north arrow to the top of the page or if necessary to the right. Begin with the biggest scale and finish with the smallest. Group drawing types together – site plans then floor plans, elevations then sections, stair details then construction details. Leave gaps in drawing numbers – the A100 series is for plans, A300 series for elevations and sections, A400 series for details. Line everything up. Titles fit neatly and perfectly under each drawing, the drawings themselves are spread evenly apart, a page of details is aligned to a razor-sharp grid, a window and door schedule is aligned to floor levels. Face details in the same direction each time, inside on the left and outside on the right. Keep notes to a bare minimum. Where absolutely necessary, place notes to the right of and above drawings. Place dimensions to the left of and below. Point dimensions upwards or to the left. Use unique shapes for each type of documentation tag – circles for windows and doors, ovals for material codes, rectangles for wall types, filleted rectangles for structural codes. Keep notes, leaders and dimensions clear of drawing lines. Place room names in the centre of each room. Place material tags in the top left corner of each material. Use unique hatches for each material. Retain a maximum of only one file of each type: one ground floor plan, one elevations drawing, one details page. Let the Cloud back up your files, and make sure there is never any doubt which file is the current one. Except at the end, when they’re not. An exceptional documentation set starts militantly rigorous, and finishes hippy free. If you just have to squeeze one more diagram on a page, jam it in there. If a 1:5 detail really has no place to call home other than amongst the 1:500 site plans, then so be it. If misaligning that last joinery elevation will make your life infinitely easier, then grit your teeth and do it. And dammit, if there’s just no room for that dimension on the left, pop it over to the right and treat yourself to a beer. Follow the rules, and then don’t, author’s own image.